SUNNYVALE, California, USA, November 13, 2018. Women in Localization (W.L. ), the leading professional organization for women in the localization industry, is thrilled to announce their 10th Anniversary as an organization dedicated to supporting Women in Localization. They celebrated their anniversary by giving back to Translators Without Borders and inspirational wisdom from Silicon Valley leaders, Anna Yen and Lisa Stone. Members and supporters of Women in Localization gathered the evening of Friday, Oct. 5, 2018 to celebrate the organization’s 10th Anniversary at Fairview Crystal Springs in Burlingame, CA. The gala event marked a decade since Women in Localization was founded to provide women and their allies in the localization industry with opportunities for networking, education, career advancement, mentoring and recognition. 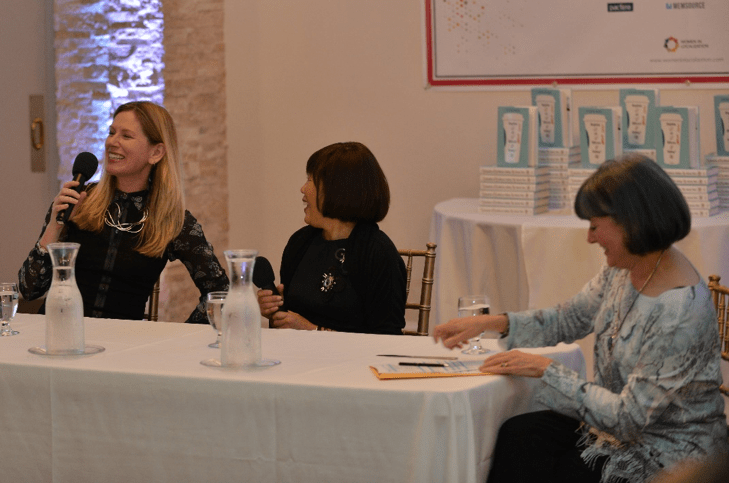 In addition to marking the milestone anniversary, the event was an opportunity for Women in Localization to give back through a fundraiser for Translators Without Borders. 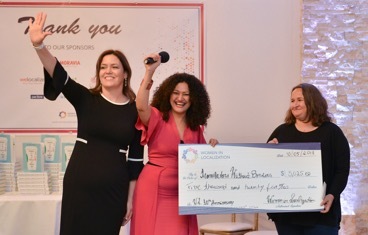 Thanks to generous support from members and generous corporate sponsors, including Gold Sponsor Moravia, Women in Localization surpassed their target donation goal of $4,000 by 25%, presenting a check for $5,025 to Translators Without Borders Board Member Iris Orriss during the event. The fundraising check is presented to Iris Orriss (R) by Silvia Avary-Silveira (L) and Fadwa Asaad (center). While the funds will support many activities, portions are earmarked for Translators Without Borders’ Language Equality Initiative called Gamayun. This cross-industry project aims to improve fairer access to language technology and ensure the progress of machine translation benefits all people, not just those who speak and use the Internet in “commercially viable” languages. The evening’s festivities kicked off with a cocktail reception, followed by a formal sit-down dinner and discussion between distinguished entrepreneurs and longtime friends Anna Yen and Lisa Stone. Loy Searle (far R), Women in Localization Vice President, hosted a panel with keynote speakers Lisa Stone (L) and Anna Yen (center) where they shared their wisdom and experience. Reflecting on their long careers in tech, Yen and Stone provided insight on how they achieved success in Silicon Valley. Both agreed that networking and mentorship are critical factors to success, and women should strive to always be learning and reach outside their comfort zones to embrace new challenges. As a global organization, the celebration extended around the world to Women in Localization’s many international Chapters. Chapters in Argentina, the Netherlands, Barcelona, Singapore, Japan and the Pacific Northwest discovered a perfect mix of local speakers and delicious food worked well to mark the occasion. The Beijing Chapter had double the reason to celebrate, marking both the 10th Anniversary and the Chinese Mid-Autumn Festival at the same event. The Polish Chapter live streamed the gala event, watching the revelry unfold in real time. And, finally, to continue the festivities as long as possible, the Pacific Northwest Chapter extended the celebrations two more weeks by inviting LocWorld38 attendees to a networking get-together in Seattle. The Women in Localization Board of Directors extends their many thanks to the committee members who worked hard on the festive event, including Silvia Avary-Silveira, Fadwa Asaad, Erica Haims, Fabiano Cid, Sabine Rioufol, Magdalena Enea, Sheena Makhecha and Tanya Badeka. Women in Localization Argentina Chapter celebrating the organization’s 10th Anniversary.